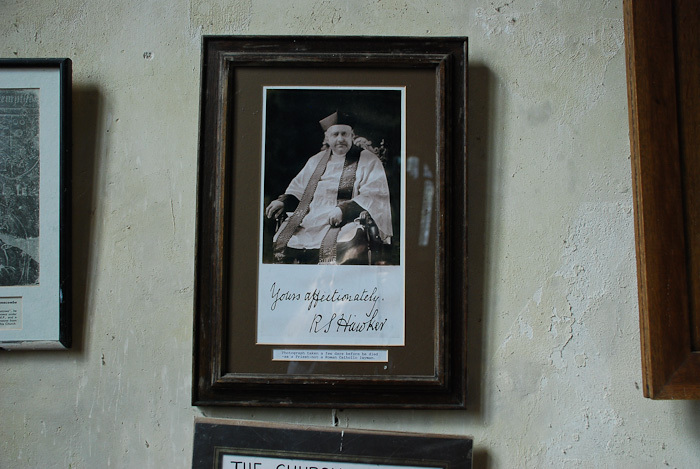 Signed portrait of Robert Stephen Hawker (1803 – 1875) in the church of St Morwenna and St John the Baptist, Morwenstow, Cornwall. The typed insertion beneath his signature refers to the controversy which sprang up after his death: it reads, ‘Photograph taken a few days before he died – as a Priest – not a Roman Catholic layman’. 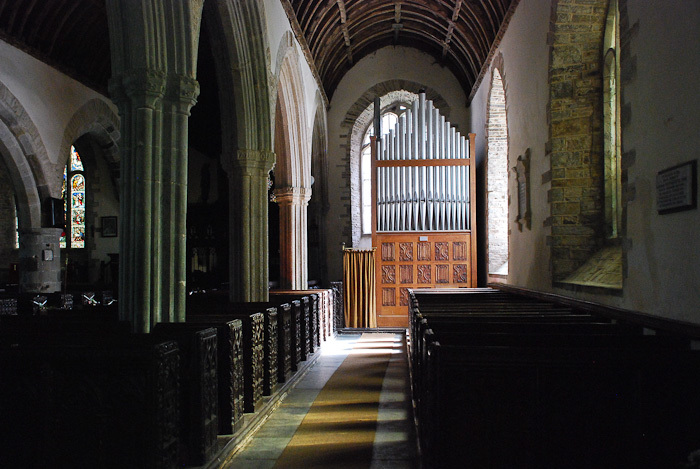 Even the visitor who knows nothing of Robert Stephen Hawker will find the evidence of his life and work as Vicar of Morwenstow between 1834 – 1875 solidly apparent. The ancient church still surviving in its lovely setting, the imposing stone vicarage, his ingenious hut, tucked into the slope below the Coast Path; each is as much a part of the place as the wind-blasted trees, the formidable cliffs and the dizzying views of the sea breaking on the rocks below. As the first resident vicar in Morwenstow for over one hundred years, Hawker inherited a ruined vicarage and seriously dilapidated church. 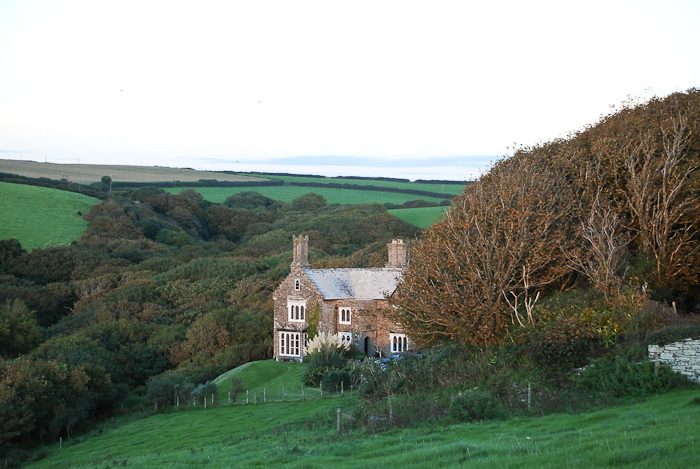 The most direct road from Morwenstow to Bude and Stratton was often impassable due to flooding and the only school met in a tumble-down cottage. During the first five years of his incumbency, Hawker raised funds for a number of substantial improvements: the building of a bridge at Coombe, the restoration of the church and the construction of a new vicarage. By 1843 he had built a school, with a dwelling provided nearby for a schoolmaster. St John’s Well, now cared for by the National Trust, was also rescued by Hawker for the parish, following his vigorous defence of a boundary lawsuit brought by a neighbouring landowner. 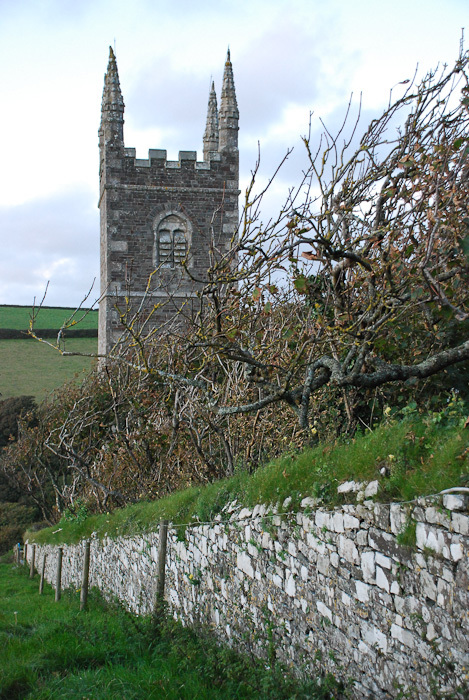 Morwenstow church tower from the footpath leading to ‘Hawker’s Hut’. Yet Hawker’s fame, resting as it still does largely on Sabine Baring-Gould’s willfully misrepresentative and hasty biography published only a few months after his death, often has the effect of concealing the solid substance of his achievements behind a web of fanciful allusions. Despite the fantastic ideas which teemed through Hawker’s mind and found vent in his writings he was a person as preoccupied with earthly concerns as with spiritual ones. His habit of equating birds with angels, Ubi aves, ibi angeli – where birds are, there are angels – and his belief that on his solitary rides through lonely coastal valleys he might now and again encounter a demon, demonstrate imagination rather than folly, and his knowledge of farming and his pride in his thriving crops and healthy livestock is evident in many of his letters. The Mind is separable in its attributes and existence from the Body. Our thoughts survive ourselves. Our words awaken living echoes when we have been long dead. Our hopes and fears, our schemes and visions receive a vivid existence after we are dust: for they are revived and accomplished by other men. Posthumous fame is of little value. It is like a favourable wind after wreck. Angela Williams please contact me. Thanks. Excellent site- I have recently picked a book up called Hawker of Morwenstow- Piers Brendon and whilst looking into this as this is signed by K. ? M Wellby I came across this site- Excellent- I almost feel as if I know him!! !